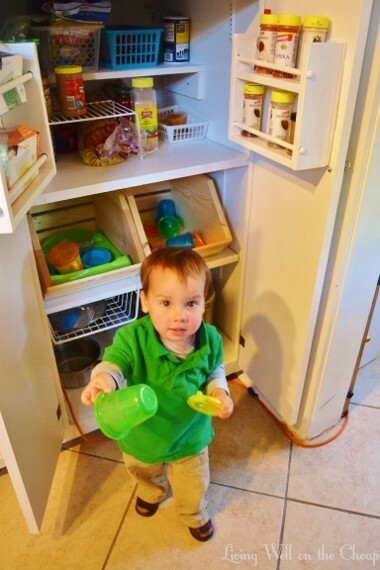 One of the remaining issues to be addressed in my pantry is sippy cup problem. Aside from the sippy cups themselves, there are all sorts of other toddler eating accessories, like plates, snack cups, and bibs. Upper cabinet space in our kitchen in limited and if these things are going to be in a lower cabinet they might as well be someplace that Jack can access them and help put them away. So I’ve had them on this shelf ever since I added it a while back, but they were just sort of flung in there haphazardly along with some other random items. I was desperate to create some order but new that large baskets would be unwieldy for Jack. Enter these wood bins I found at Michael’s! They’re labeled as vegetable bins and are I think $12 or $13, but I kept an eye on the Michael’s app on my phone and whenever a good coupon popped up I’d go get one. I ended up paying about $15 total. I put sippy cups and lids in one, everything else in the other. And there’s about ten inches of space behind them for me to store rarely used items. Jack doesn’t have to pull them out to use them, which would’ve been a big problem with baskets. I can tell you right now that if I’d gotten baskets he would just pull them out and dump them on the floor before grabbing a cup and moving on to begging me for snacks and milk. Just imagine that sweet face saying “Pease? Pease?” and try saying no, you can not have 17 cups of milk in one day. Then he’ll move on to begging for raisins. Rinse, lather, repeat. But at least now he can put his own stuff away (and he seems to be putting them in the appropriate bins so far)! Milk and raisins might as well be cocaine and poppers for how addictive they are in my house. Oh! This is such a great idea! 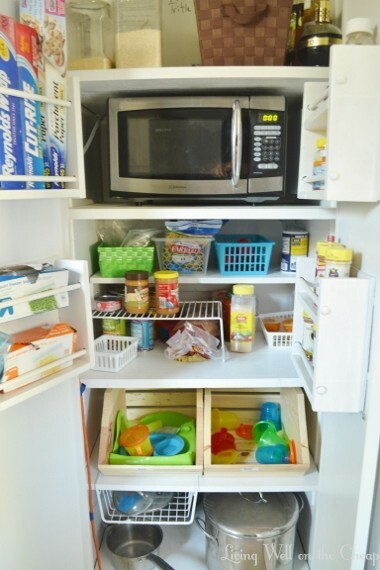 Love those bins.. might have to investigate how they would work for our kitchen storage. Thanks for the tip! What cutie! 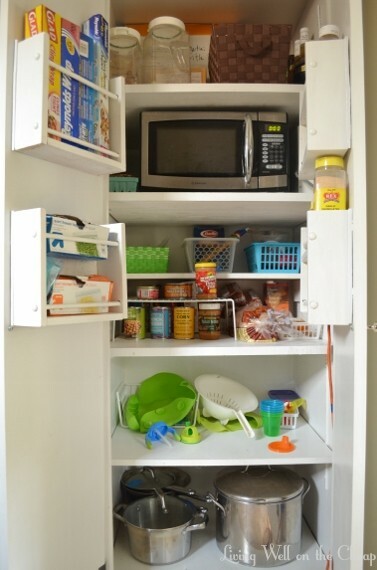 Great way to organize your pantry and get your son to participate in the process. It’s never too early to learn those important skills! You gotta teach em when they’re young! I’m gonna have this boy vacuuming before he can read.